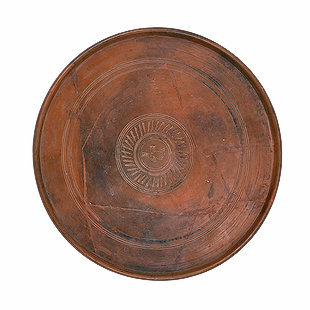 This clay plate has an ornament in the center in the form of a cross, bordered by a round frame and decorated with leaves. It was probably used as a mold for clay shapes to adorn walls inside houses of worship or in homes. The shape is modified and the leaves are considered by the Copts to be a sign of victory, sublimity, and purity of heart.